I have made vanilla extract in the past with bourbon and while I liked it I have been wanting to try a more neutral flavored alcohol. So with some downtime around the Thanksgiving holiday weekend, I decided to make a couple of batches. There was a bit of rum left over from the last margarita blitz so along with that I picked up a bottle of vodka on my way out of the city. 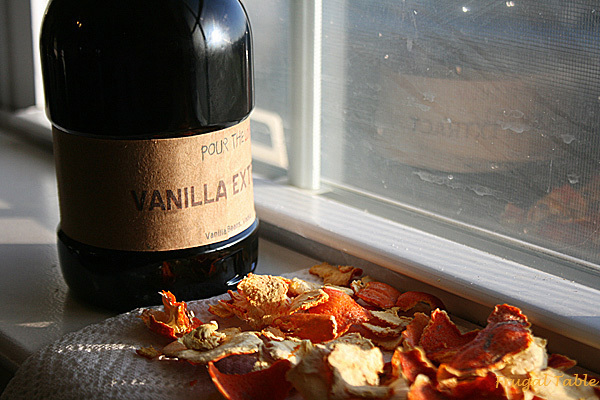 Making vanilla extract is so easy I don’t know why I haven’t been making it all along. 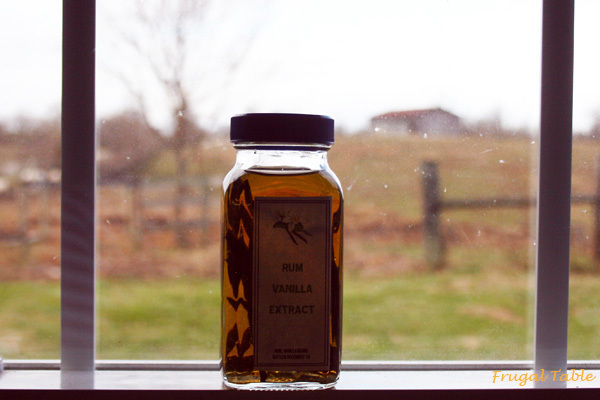 It does take some time for the vanilla beans to infuse the liquor but still – so easy and much less processed than store bought vanilla. I had quite a few vanilla beans on hand as I pick them up at my local food co-op and whenever I see them on sale in the grocery store. There are also online sites that you can order them from though I’ve not done that yet. I started with the vodka, 6 Madagascar vanilla beans and a clean, sterilized bottle. I just happened to have a cute little herb bottle that I had saved and an old liqueur bottle. Cut the beans in half longwise, then in half or thirds across, put the beans in the bottle and top with vodka. Leave enough head room in the bottle to be able to shake it. Put the cap on and be sure to label it so you won’t have to guess as to what is in there later. Next up was that bit of rum which fit perfectly in the small herb bottle I had on hand. I usually keep a stash of bottles and jars just for times like this. Once everything is bottled, give it a few shakes and store somewhere dark and cool to infuse. Mine are residing in the back of a bedroom closet. I’ll shake them a few times for the next couple of months then will check the flavor. I usually let mine sit for 3 or 4 months but depending on how many beans you use, the flavor may be where you want it in just a month or so. Enjoy! Please use a clean sterilized bottle of your choice. I usually use around 6 vanilla beans. Cut them lengthwise then across into halves or thirds to fit into the bottle. 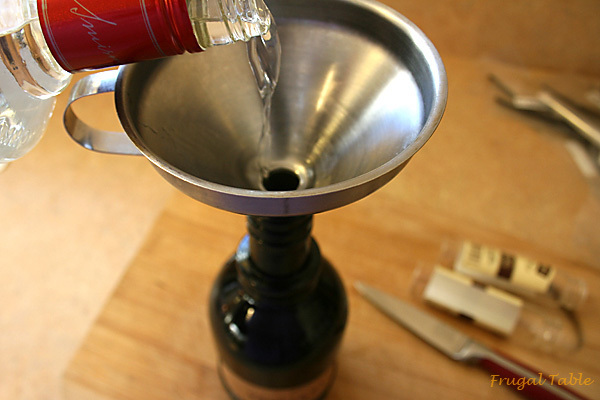 Pour alcohol over leaving enough headroom to be able to shake the contents. Store in a cool dark spot. Check in a month, shake and leave longer if needed for flavor to develop. Check every few weeks. Enjoy!